Cecil Shorts (right) dislocated his shoulder on the final play of the game last week against Atlanta. The Colts won’t be the only team shorthanded entering their Thursday night game against the Texans, as Houston will be without two of the their top three wide receivers as well. Nate Washington and Cecil Shorts were among five Houston players ruled out of the AFC South matchup. Washington, who is dealing with a hamstring injury, has 13 receptions for 210 yards this season. 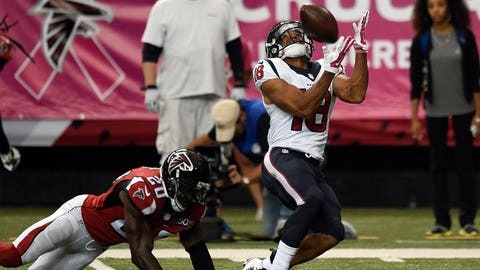 Shorts, who dislocated his shoulder on the final play of Houston’s 48-21 loss to Atlanta last Sunday, has 22 receptions for 236 yards and a touchdown on the year. In their absence, rookie receiver Keith Mumphrey will likely see an expanded role playing opposite DeAndre Hopkins. Fellow rookies Jaelen Strong and Chandler Worthy also figure to see increased playing time as well. The Texans will also be without safety Quintin Demps, linebacker Akeem Dent and running back Johnathan Grimes. Linebacker Whitney Mercilius, running back Chris Polk and safety Lonnie Ballentine are listed as probable. Indianapolis is reportedly set to play without star quarterback Andrew Luck for the second week in a row as he recovers from a shoulder injury.